Rialin Guest House is situated in a quiet suburb of Odendaalsrus, providing a good stopover when travelling from Johannesburg to Bloemfontein. 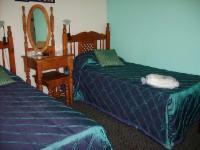 The guest house has five comfortable en-suite bedrooms, comprising twin beds or a double bed. Each room is equipped with a TV with selected DStv channels. There are also outdoor showers available for a real farm experience. Full hearty breakfasts are served in the dining area, and if required, dinners can be prepared upon request. Guests are welcomed to relax at the lapa. The lapa can also be converted into a conference venue with enough seating for 50 delegates. There is a braai facility for guests and secure parking to ensure peace of mind. 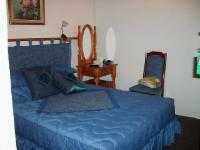 The guest house is within walking distance to the town center and various amenities such as shops. You can be assured your host, Ria, will offer you outstanding South African hospitality. Luke warm bath water was a put off - even though Ria had a chance to heat the geyser prior to us arriving.Breakfast was all good - would have been nice to have eaten a bit earlier yet Ria did not wish to rise earlier. We were not able to stay due to fully booked and upon arrival we had to taken to a private housefor sleeping and go back to guesthouse for breakfast. Upon payment of deposit we still had our time left for booking but it seems bookings are overbooked and therefor it was unpleaseant because we dont know the town or area to get any other accommodation. We really enjoyed our stay. The breakfast was marvellous. The place is very nice and clean. Very neat and tidy. Good service and breakfast. Rialin Guest House is 0.6km from the centre of Odendaalsrus , the nearest airport 141.5km (New Tempe Airport).